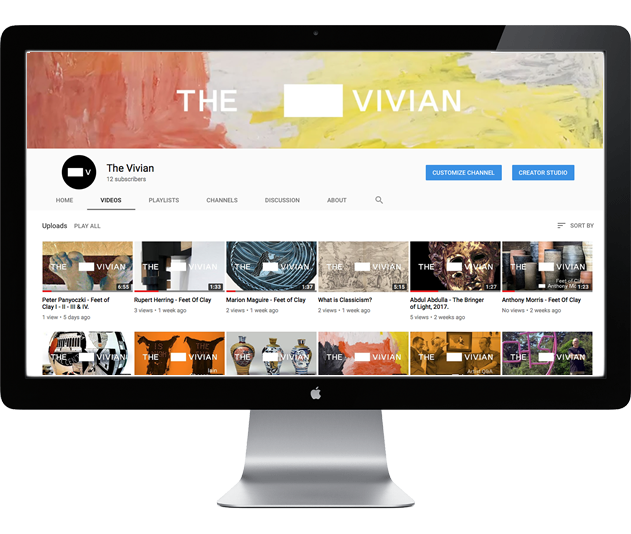 We love making videos to help you discover and explore artists in our shows. Each month we add lots of new videos your our YouTube channel. We also add selected videos to this page too. Subscribe to our channel and tell your friends! Our first ever performance art event – Ivan kindly took part in this Artist Q&A - talking about his work and this performance. LXXX - An Artist in the Making - Opening Event - Speeches by Scott Lawrie and Anthony Morris. Trailer and invitation video to Anthony Morris - LXXX - An Artist in The Making. In this short video Scott Lawrie talks about the upcoming performance art event at The Vivian with internationally renowned artist, Ivan Lupi. The Junction Magazine - An in-depth feature on the past 12 months at The Vivian and insights into future shows and events at the gallery over the coming months. A Line Between Two Points - Scott Lawrie, Director of The Vivian, introduces us to the show and talks about the work of Monique Lacey and Rebecca Wallis. Tira's work responds to the contemporary digital context in which we now view the world. Blurring the boundaries between function and form. His work is created from rescued and bunched colonial carved spindles in painted native New Zealand timbers. Marion Maguire's playful prints often reference Greek myths - Often including contemporary notes and other references, such as Maori carvings. Abdul Abdullah is one of Australia’s hottest young artists. The Bringer of Light, 2017 is the image we chose for all our posters for Feet of Clay, as it captures the ultimate question we curated the show around – is classicism even relevant to contemporary artists working today? Anthony Morris is a iconic kiwi ceramists with an international reputation. We are delighted to show some of his Crete and Primitive pots, inspired by his world travels. There are very few of these examples left in existence, so make sure you don’t miss out. Paul Maseyk's monumental work, 'One Pot Wonder' has become one of the stars of the Feet of Clay show. Standing over 2m high, and taking over 5-months to make and paint, it’s a work rarely seen outside of the major art institutions. We love Iain Cheesman’s work – and his fantastic sense of humour! ‘Is Nigh The End’ – two calf skins, held in place by cast bronze arrows, with punched out lettering – is his brilliant response to the premise for Feet of Clay. Oooh yeah baby... the exquisite work of Aaron Scythe - showing at Pop Pachimon Show. Here’s your chance to own an outstanding example of Kiwi/Japanese fusion ceramic art by the legend himself. Sally Gabori's work explores the landscapes of her country, and her ancestral history. Deeply moving, honest, and raw, her work can be seen in important collections and major art galleries around the world. How Exciting! - Our first Vivian Artist Q&A with the sensational Aaron Scythe - discussing his practice and methods. We'd love to hear what you think and if you'd like us to do more. Here, Dr Andrew Paul Wood, author of the Feet of Clay essay, gives a quick overview of the origins and myths surrounding these Western ideals, which are still referenced by many contemporary artists today. Iain has made a name for himself as an artist with his quirky, small-scale, and often very funny plastic sculptures. So The Vivian commissioned him to do a somewhat larger-scale work in steel. Take a sneak peek at the incredible work of New Zealand based artist, Peter Panyoczki. These 4 works are mixed media on aluminium and are available to view at The Vivian. Thanks for your kind comments about our 2-min tours! Here, for your wine-in-hand viewing pleasure, is the full length video tour. Share away as much as you like. A very special ceramic work - 'Night Nurse' by groundbreaking ceramic artist, Virginia Leonard. This piece was made for the Exodus show at The Vivian.